In this workshop, we will be working with animals that, for various reasons, are being held at the East Valley Animal Shelter. This is an opportunity to discover ways of healing both body and spirit of these companions - most of whom are there due to serious neglect. We will learn what shamanic methods are most appropriate to bring them comfort, healing and retrieving of any wandering souls. 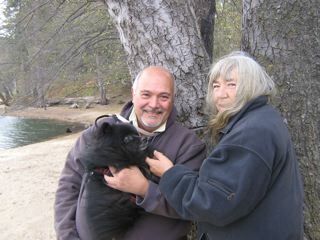 What is learned in this workshop can be used in our own animal companions or those whom we might encounter on our path. Doing this work is one way we can give back to our animal family. We invite your contributions, both text and pictures, regarding this topic. Some are posted here. A portion of these fees will be donated to the Animal Shelter. Make the checks payable to Shamanic Visions. Complete payment must be received by September 1. These fees do not include lodging. If you are coming from outside the Los Angeles area, you will need to arrange for your own lodging. Cancellation: Cancellation must be received by September 1st for a full refund (minus $25 administrative fee) and after that date, no refund is possible. If you are interested in this workshop, we urge early registration. Enrollment will be limited because we will be meeting and working within the animal shelter and they only have limited space.We will meet from 9am - 5pm Saturday and Sunday. Upon receipt of your registration, a description for getting to the meeting place (the Animal Shelter) will be sent to you. Choice of Lodging (if applicable): Please indicate your preference when registering. Make Payments to "Shamanic Visions".